and the shpiel must go on! So eat, drink, and be merry with your Temple Beth Sholom Family! 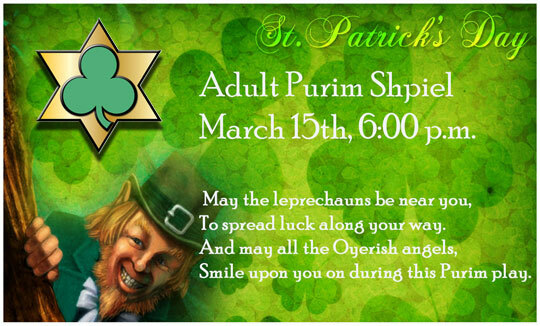 Join us for Drinks and Merryment in the Rotunda for St. Paddy’s Day Purim at Temple Beth Sholom! Drinks: Irish Cofee & You are also encouraged to bring your own libations to Ye Olde Shamrock Pub of Shushan! Doors open at 6pm, with the Shpiel starting promptly at 6:30 – don’t be late! Following on last year’s success, we will have an extra participatory Purim shpiel, complete with karaoke singing and dancing that will lead us into the evening! Reservations for dinner are now closed. So eat your dinner first, then come for the shpiel!